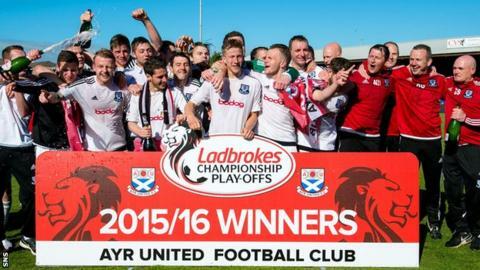 Goalkeeper Greg Fleming was Ayr United's hero as they secured promotion to the Scottish Championship after a penalty shoot-out at Somerset Park. The sides were level at 1-1 after the first leg at Stair Park and chances were at a premium during a dour return that finished goalless. Fleming saved nervy spot-kicks from Paul Cairney, Jamie Longworth and David Barron. And Andy Graham took his chance to fire the winning penalty for Ayr. Jordan Preston and Alan Trouten had already beaten Stranraer goalkeeper Cameron Belford from the penalty spot and, although Ross Docherty fired against the post, defender Graham's strike signalled a pitch invasion in the Ayrshire sunshine. Willie Gibson was the only Stranraer player to find the net as the Blues squandered a chance to return to the second tier for the first time since 2006. Instead, it is Ian McCall's Honest Men who take the step up after a four-season spell in the third tier. Ayr had gone into the game as favourites after Docherty's stoppage-time equaliser in the first leg stretched their unbeaten run to three games. They had already defeated Stranraer in three of their five meetings this season and had finished 10 points clear of their visitors as runners-up behind Dunfermline Athletic. Stranraer, who had been bottom of the League One table at the turn of the year, were looking to complete a remarkable recovery that led to them qualifying for the play-offs by finishing fourth and then beating Livingston in their semi-final. Brian Reid's side had scored eight goals in relegating Livi, while Ayr had struck six against Peterhead as they joined the Blues in the final. However, this second leg of the final never threatened to be a goalfest as nerves got the better of any attempts at fancy footwork on the fiery surface. Stranraer just edged the match in terms of chances, with an Andy Stirling drive forcing Fleming to make the first save. Preston had an attempt saved by Belford at the other end while further chances were squandered by both sides. However, Stranraer had the best chance during normal time, with Stirling firing over when through on goal. Substitute striker Longworth headed wide in extra time then narrowly failed to get a touch on a Stevie Bell header across the face of goal in the dying seconds as the Blues were left wondering what might have been. Match ends, Ayr United 0(3), Stranraer 0(1). Penalty Shootout ends, Ayr United 0(3), Stranraer 0(1). Goal! Ayr United 0(3), Stranraer 0(1). Andy Graham (Ayr United) converts the penalty with a right footed shot to the bottom left corner. Goal! Ayr United 0(2), Stranraer 0(1). William Gibson (Stranraer) converts the penalty with a right footed shot to the bottom left corner. Penalty missed! Still Ayr United 0(2), Stranraer 0. Ross Docherty (Ayr United) hits the left post with a right footed shot. Penalty saved! David Barron (Stranraer) fails to capitalise on this great opportunity, right footed shot saved in the centre of the goal. Goal! Ayr United 0(2), Stranraer 0. Alan Trouten (Ayr United) converts the penalty with a right footed shot to the bottom right corner. Penalty saved! Jamie Longworth (Stranraer) fails to capitalise on this great opportunity, right footed shot saved in the bottom right corner. Goal! Ayr United 0(1), Stranraer 0. Jordan Preston (Ayr United) converts the penalty with a right footed shot to the bottom left corner. Penalty saved! Paul Cairney (Stranraer) fails to capitalise on this great opportunity, right footed shot saved in the top left corner. Penalty Shootout begins Ayr United 0, Stranraer 0. Second Half Extra Time ends, Ayr United 0, Stranraer 0. William Gibson (Stranraer) is shown the yellow card for a bad foul. Attempt missed. Patrick Boyle (Ayr United) header from the centre of the box misses to the right following a set piece situation. David Barron (Stranraer) is shown the yellow card for a bad foul. Foul by David Barron (Stranraer). Jamie Adams (Ayr United) wins a free kick on the right wing. Attempt missed. Steven Bell (Stranraer) header from the left side of the six yard box is close, but misses to the right. Attempt missed. Jamie Longworth (Stranraer) header from the centre of the box misses to the left following a corner. Corner, Stranraer. Conceded by Patrick Boyle. Delay in match Peter Murphy (Ayr United) because of an injury. Second Half Extra Time begins Ayr United 0, Stranraer 0. First Half Extra Time ends, Ayr United 0, Stranraer 0. Substitution, Stranraer. David Barron replaces Mark McGuigan. Hand ball by Robbie Crawford (Ayr United). Steven Bell (Stranraer) is shown the yellow card for a bad foul. Alan Trouten (Ayr United) wins a free kick in the attacking half.